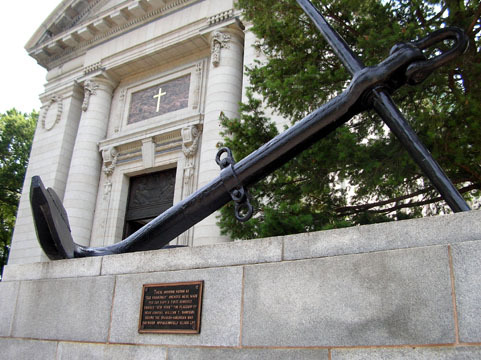 Anchor made for the Navy's first armored cruiser, New York, the flagship of Rear Admiral William T. Sampson during the Spanish-American War, now on display outside the US Naval Academy chapel. There that there was a wedding in the chapel so unfortunately we were unable to go inside. 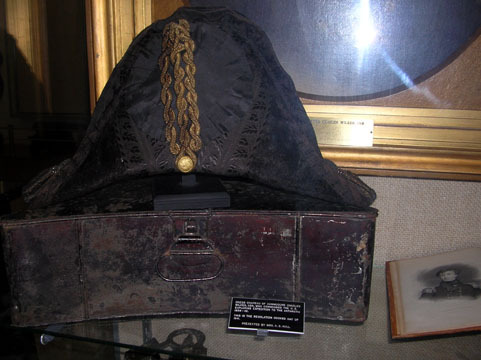 Chapeau bras of Commodore Charles Wilkes, who wore it while leading an Antarctic exploration in 1841, now in the Naval Academy Museum, which houses a fabulous gallery of ship models, a main hall of naval artifacts and artwork and a nautical and military-themed bookstore. Lots of naval officers are glorified for their exploration and scientific roles, not fighting, which I appreciate a lot (not trying to glorify the US military here but admiring the developments in sea power and technology). "Tecumseh" is what this wooden figurehead is called, affectionately known as the "god of 2.0"; midshipmen throw coins at the outdoor bronze replica of it before exams now that this more fragile wooden original has been moved indoors at the USNA visitor's center which houses exhibits on life for midshipmen, graduates who became astronauts, Navy athletes and John Paul Jones. 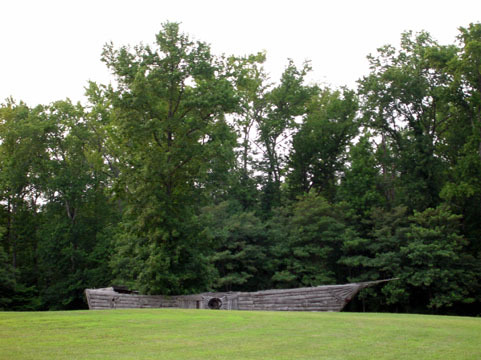 The carving was meant to represent Chief Tamamend of the Delaware Indians and graced the bow of the third USS Delaware, which was burned and sunk by the Union in 1861 to prevent the Confederacy from taking the ship. 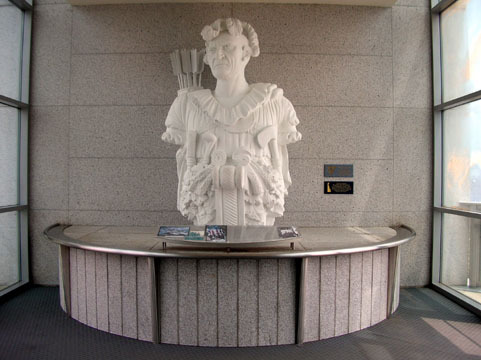 When raised after the war, the figurehead was intact and has been at the Naval Academy ever since. 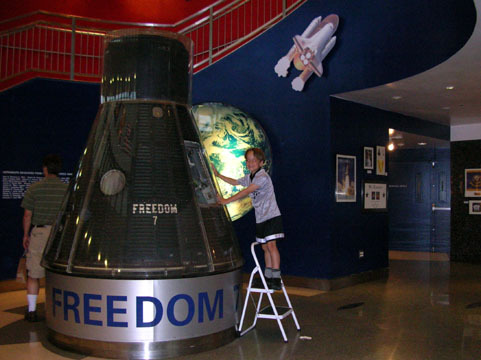 Freedom 7, in which Naval Academy graduate Alan Shepard became the first American in space. His flight in the Mercury spacecraft lasted barely 15 minutes, and having seen the size of the section that housed him from the ladder in this photo, also taken in the visitor's center, I believe that was a good thing. 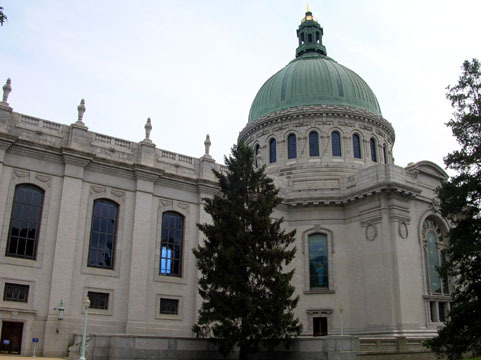 Another view of the Naval Academy chapel with its stained glass windows. 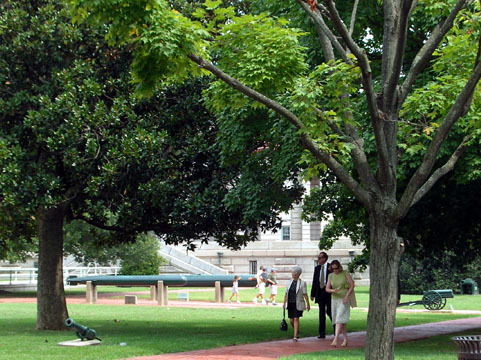 There are cannons, torpedoes and other retired military equipment all over the grounds of the USNA. 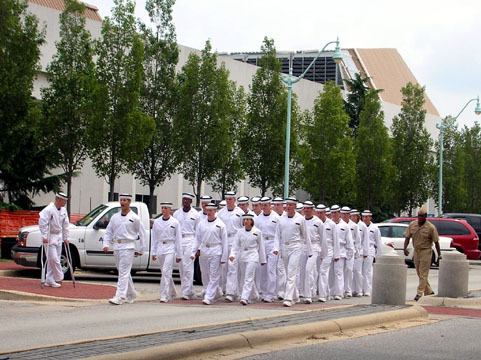 Part of this year's Plebe Summer class marching on the USNA grounds. 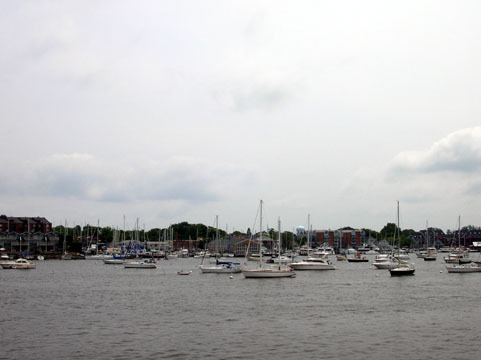 The program is designed to turn civilians into midshipmen. The Maryland State House, built in 1772, which served as the US Capitol from November 26, 1783-August 13, 1784; it was here that Congress ratified the Treaty of Paris to end the Revolutionary War. 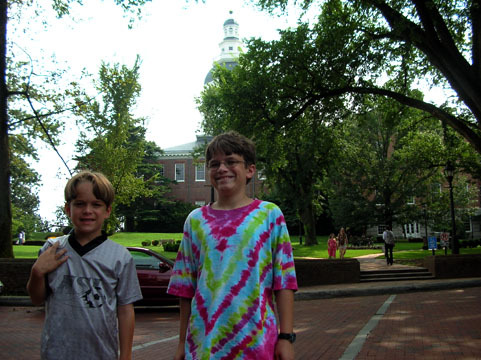 This is the oldest state house in the nation still in use by the legislature. 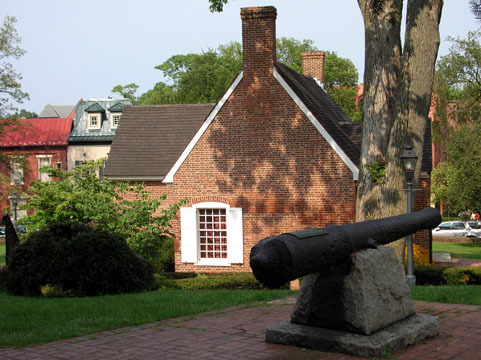 This cannon was brought from England in 1634 and mounted at the fort at St. Mary's; it was recovered from the St. Mary's River in 1822 and given to the State of Maryland in 1840. 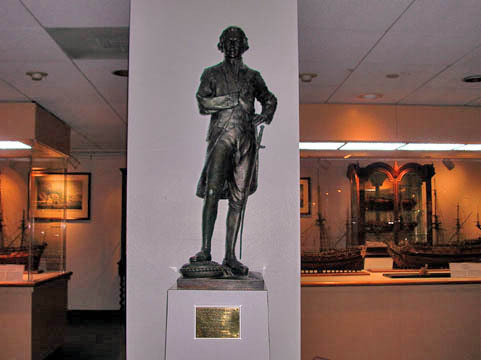 The 15-foot Maryland Federalist. 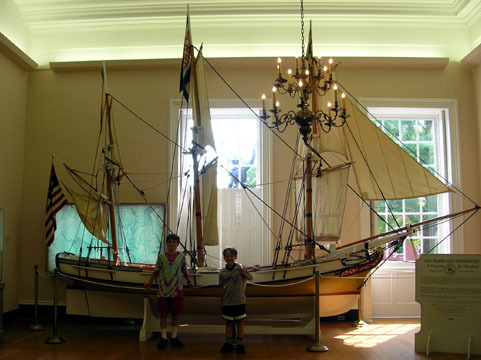 The original was built in built by merchants in Baltimore in 1788 to celebrate Maryland's ratification of the U.S. Constitution and given to George Washington as a gift, but sunk soon after in a hurricane. 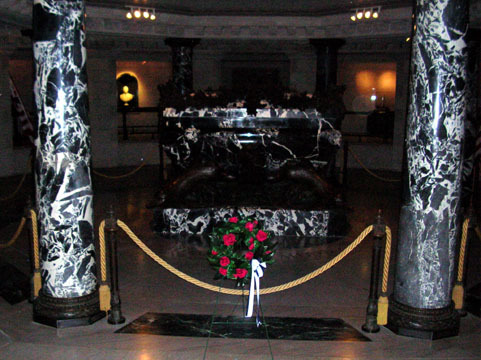 This replica was built in 1988 to celebrate the bicentennial. She is owned by the state and, as you can see, is unlikely to sink in a hurricane. 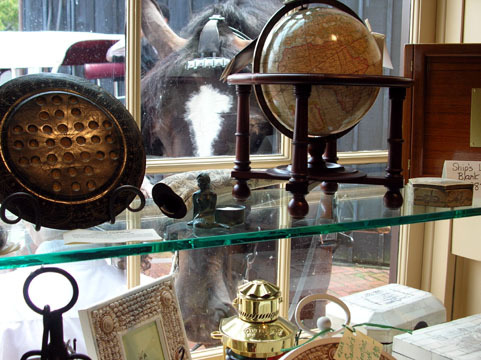 A horse looks through the window of the museum store which has lots of lovely nautical treasures. College Creek cuts right through the middle of the city. It's very pretty. 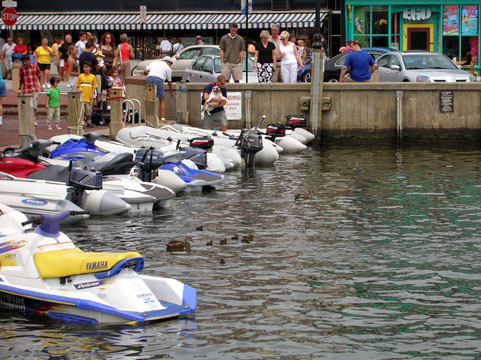 People watch the mommy and baby ducks while a man prepares to take his dog out on the water. 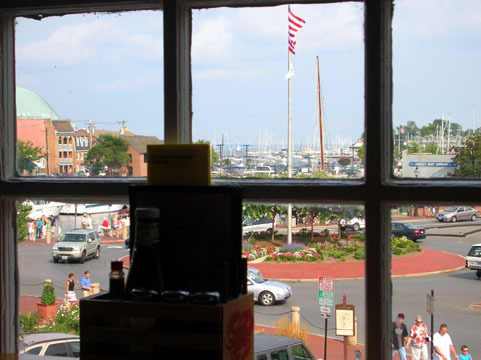 View of the Severn River from the upper floor of the Naval Academy visitor's center. View of the river out the window of Buddy's Crabs & Ribs. Sorry about the condiment display in the middle. It would be silly to go to Annapolis without having crabs, so we had acream of crab soup, crab dip, crab cakes and chicken tenders for Daniel who was in an anti-seafood mood. Plus we munched Crab House Nuts & Barnacles. 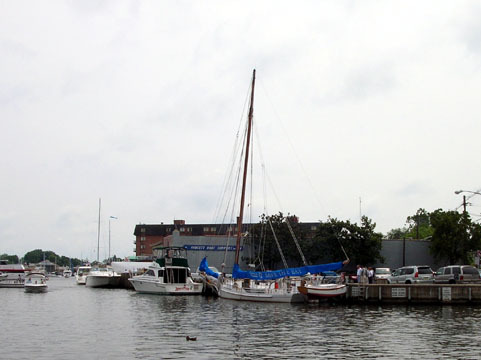 At Quiet Waters Park in Annapolis, a tree is growing as the "mast" of this wooden boat. We went there to hear Melanie Mason and her band.